Dollar for dollar, choosing well made, long lasting garments gives you the best style bang for your buck. With less than 15 minutes to get dressed and out the door, I needed an outfit that looked well put together, professional yet creative. I also wanted to be wearing something I felt comfortable in, and that felt "like me." I didn't want to look as off-the-cuff as I felt, and didn't have the time, or the budget to shop for something brand new. Black + White + READY for action. Shoot (pictures) first, and ask (interview) questions later. Recently, I trotted off to an interview- it was a bit spur of the moment, and I didn't have much time to fuss about what to wear or how to wear it. I had just enough time to quickly clean up, get dressed and meet some interesting folks. I of course, had high hopes of making a good impression. With the bus ETA in 15 minutes, I splashed my face, rubbed on some blush, and plunged into the act of dressing for success. 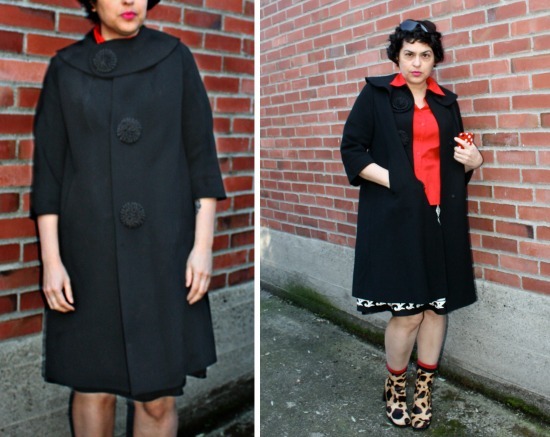 A vintage 1960s black heavy weight womens wool coat with silk florette button covers. 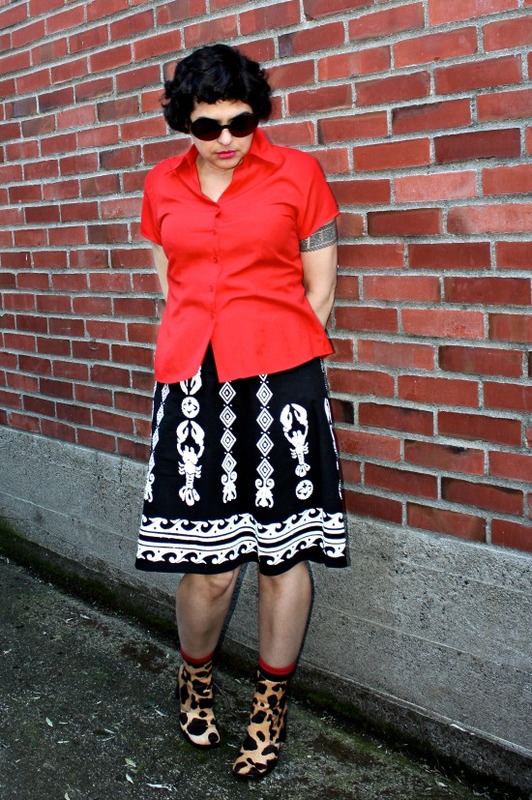 A vintage 1950/60 style womens fitted cotton-blend shirt in bright cherry red. 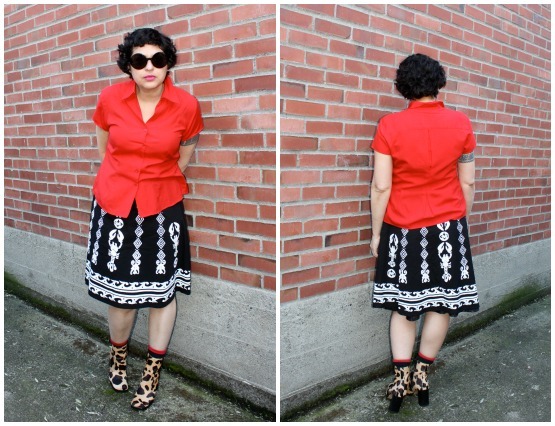 A thrifted, new with tags, A-line skirt, silk screened + sequined with a white lobster motif. Thrifted, nearly new Bruno Valenti pony hair animal print ankle boots. Dressing for Success almost always includes wearing an impeccably turned out coat. Strong color combo = strong impact. I wanted to make a good, and memorable impression. Red, black and white are one of the most powerful color mixes you can make. Done right, this combo packs a punch. Whenever you don this heady and confident color combination- consider yourself punched and remembered. Coat of confidence. The first thing people see when they meet you, is more than likely your outerwear, and I wanted the impression of me to be chic, classic yet quirky and prone towards quality. This vintage coat, I believe says all that, and in perfect diction. It's an incredibly well made coat- and while it has many hallmarks of the 1960s, it's clean lines and boxy cut, still looks very fresh and fashionable today. A Perfect Pair: the power of separates. While I normally make dresses my daily "go-to" I wanted to challenge myself and wear separates, and see if I could reflect my way of dress in previously unworn garments hanging in my closet. When you choose classic cuts and colors, the challenge is easier than you might think. Neutral (red) paired with neutrals (a graphic black and white print) is an easy way to put together a smart looking ensemble, quickly. Both top and skirt could have been styled a number of equally smart ways. Keeping it simple, and putting on just a top, and a skirt nearly broke the sound barrier in speed dressing: all said and done in less than 5 minutes. Classic Cuts. Now it's no secret that I'm no skinny Minnie, I'm a solid womens size 14, and I deal with dressing a rather thick (and ever thickening) middle. I need room to feel comfortable, but seek out silhouettes that enhances the curve factor, and not the chub factor. A slim yet roomy blouse with bust and waist-line enhancing darts is just the ticket. And for insta-hourglass, you can't go wrong in wearing an A-line skirt. Both are classic cuts- and there's a reason they've been around for decades, and are still going strong. As long as their lines flatter the figure, they'll always be "in style." Go for Kicks: shoes with character. The easy finish would have been to add some black shoe to this red/black/white interview ensemble. Black is classic- and I've got LOADS of great black leather pumps, platforms, boots, booties, sandals, stilettos, mary janes, wedges, etc, etc. And I'm sure I would have looked and felt terrific with nearly any of my numerous black shoe options. But I wanted leave a more memorable impression- and pair of stack heeled, animal print booties, kinda sorta, do just that. I also wanted to shave off a bit of the overly retro feel of the mostly vintage ensemble, and wearing contemporary kicks takes the right amount of retro edge off the outfit. Top + Bottom + Boots + Coat = READY TO ROLL. Time spent putting together the outfit: 5 minutes. Time spent dressing: 5 minutes. Time spent of hair and make-up: 2 minutes. Time walking to bus stop: 1 minute. Time waiting at the bus stop: 2 minutes. Success! I made it on time. The interview was a success, as was the outfit. Shop #SECONDHANDFIRST: 99% thrifted. 100% Rosebud. 100% #SECONDHANDFIRST. All but the sunglasses came from secondhand sources, and everything was "shopped" from my closet. What a cool look! Love your vintage style! I have a coat almost exactly like this one that I got at Goodwill...love mine and love yours and I really like your skirt...great look, Bella! That is the best skirt ever and I love it so much with those boots! Seriously amazing outfit and the fact that it was that quick to put together, winner! They would be fools not to hire you Bella! Great outfit! You look both pulled-together and creative. Love the lobster skirt! And I agree about shoes with character - they add so much fun to any outfit. Thanks for sharing with Visible Monday, you look fab. Lobster print skirt & pony hair boots----killin' it! Look at those boots! Wicked wicked secondhand shopping skills. Fantastic outfit, Bella! I love the leopard with the lobster skirt - so very distinct and unique. I bet you made an awesome impression. 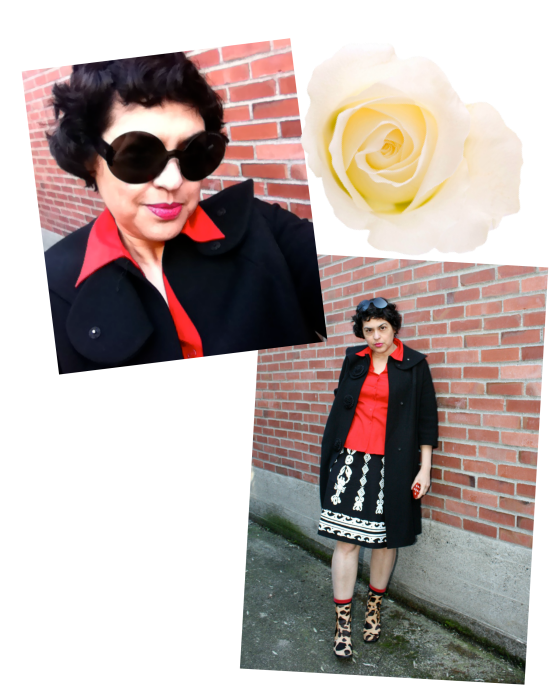 oh yes, you look so fabulous wearing our favorite color combo, black&white&red! !, but you rock it with awesome details and sassiness!, those boots and that fabulous coat and sunnies! !, you're so talented!!! They should give you the job for your outfit alone hun. You look fab. You are gorgeous, Bella! All the pieces are beautiful, the skirt is unique - and you put it together brilliantly! How you put together this stunning ensemble in 15 minutes, I'll never know. Now that's talent. Can't go wrong with animal print boots! Congratulations on a successful interview! You are so right - stick to classic ideas and you can't go wrong. I love that coat, and I think that style really suits you. The skirt - lobsters! How crazy, and yet classy! Fabulous outfit!! I am in love with the boots and the coat!!! Now THAT really is a coat of confidence - not that you actually need the outer confidence - as you exude it from within! Great outfit. I'd employ you immediately. Beautifully written and put together. I love it. I keep wishing that you'd come and compose my wardrobe! Neat outfit post, Bella! I'm so happy you had time to detail this all out for us ... and you look just as brilliant and beautiful as always! So happy to see you at VisMon. I've missed you here! Love that Lobster skirt - you look great!